Aim: The purpose of this study was to clarify detection characteristics of the secondary mesio-buccal canal in maxillary first molars using various methods. Materials and Methods: The root canal system of 86 extracted human maxillary first molars was inspected using micro-focus-computed tomography to accurately determine the number of canals. Radiographs or floors of the pulp chamber for all samples were observed for the secondary mesio-buccal canal with computed tomography for dentistry, digital dental radiography, magnifier, or the naked eye. Sensitivity, specificity, positive, and negative predictive values and diagnostic accuracy for these four methods were investigated using the results from the micro-focus-computed tomography inspection as the gold standard. All samples of each method were observed by 10 endodontists. Using these results, the χ2 test was used to compare and analyze differences between the various conditions (P<0.05). Results: The secondary mesio-buccal canal could be recognized in 60.9% of samples with the micro-focus-computed tomography. No significant difference was seen between efficiencies of the computed tomography for dentistry and the micro-focus-computed tomography. The computed tomography for dentistry was superior to the other three methods. Conclusion: Detectability of the secondary mesio-buccal canal in the maxillary first molar was superior using dental-computed tomography compared to digital dental radiography, magnification telescope, and the naked eye. However, success ratios display large fluctuations according to periapical lesion, condition of infection in the root canal, periodontal disease, and pre- or postoperative occlusive condition. ,, Some reports have described no difference in results depending on the tooth kind. ,,,, However, Swartz  reported low success rates for the mandibular first molar. Likewise, Yamaki  and Yamamoto  reported significantly inferior treatment results for the maxillary first molar. The reason for inferior treatment results on the maxillary first molar are the high rates of occurrence of curved canal and advanced curved canal. Krithkadatta et al. using the cone-beam-computed tomography, reported unusual root canal morphology in the mandibular first molar. While employing the cone-beam-computed tomography, Kottoor et al. found seven root canals in the maxillary first molar. Furthermore, treatment of the secondary mesio-buccal canal (MBII) is often insufficient or overlooked. , Research into MBII has mainly examined the rate of occurrence and morphological classifications. ,,,, Weine  defined four types according to the divergence state of the canal in the mesio-buccal root: Type I, single canal from the pulp chamber to the root apex; type II, two canals leaving the chamber and merging to form a single canal short of the root apex; type III, two separate and distinct canals from the pulp chamber to the root apex; and type IV, one canal leaving the chamber and dividing into two separate and distinct canals. However, few reports have examined detection and effective treatment methods. ,,,, Radiographic techniques offer effective, nondestructive examination. The observation by dental radiography does not always agree with that by naked eye or some other anatomical assessments, because the two canals of mesio-buccal root are overlapped in the direction of irradiation. The purpose of this study was to identify detection characteristics of the MBII for maxillary first molars according to four test methods: Dental CT; digital dental radiography; magnifier; and the naked eye. The root canal systems of 86 extracted human maxillary first molars without root canal treatment were completely inspected using micro-focus computed tomography (micro CT) (MCT100-MFZ; Hitachi Medical, Tokyo, Japan) to accurately assess the number of canals. Two researchers experienced in diagnostic imaging observed that the number of orifices, root canals, and apical foramina of all experimental teeth on micro-CT, using these results as the gold standard. Furthermore, canal systems in mesio-buccal roots were classified as types I-IV using the anatomical classification defined by Weine. For all samples, radiographs or floors of the pulp chamber were observed by 10 dentists using the four methods after accessing the cavity preparation. Sensitivity, specificity, positive, and negative predictive values and diagnostic accuracy for the four test methods were investigated using the results of micro-CT as the gold standard. Specifically, the four methods comprised dental CT (mean effective does per once: 0.03 mSv. ; PSR9000; Asahi Roentgen Industry, Kyoto, Japan); conventional digital dental radiography (mean effective does per once: 0.02 mSv. ; DFW-20; Asahi Roentgen Industry, or Denooptix; Dentsply-Sankin, Tokyo, Japan); magnification telescope with 2-times magnification (SurgiTel GL275N; GSC, Michigan, USA); and the naked eye. Imaging conditions for dental CT were dental CT mode; peak voltage, 60 kV; peak current, 2 mA; and radiation time, 20.48 seconds. Conditions for digital dental radiography were peak voltage, 65 kV; peak current, 20 mA; radiation time, 0.1 seconds. The radiation direction was set from the buccal side at right angles to the longitudinal axis of the tooth. With the magnifier or naked eye, orifices of the root canal of all samples were searched using #08 root canal instruments on the floors of the pulp chambers. 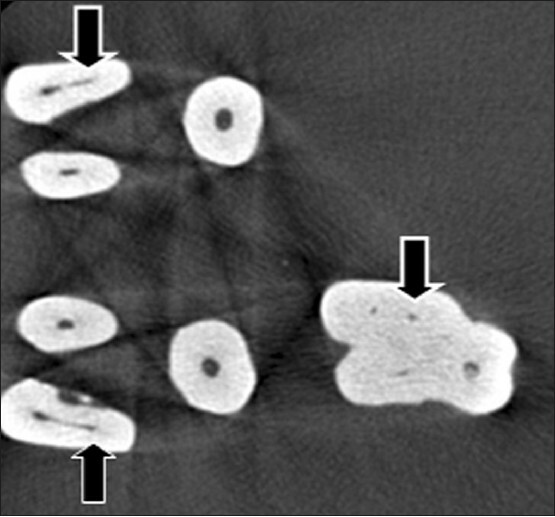 Imaging conditions for micro-CT when establishing gold standard results were peak voltage, 65 kV; peak current, 100 μA [Figure 1]. The time intervals of observation between conditions for a sample were set up long enough to avoid the examiner's preconception [Figure 2]. Sensitivity, specificity, positive, and negative predictive values and diagnostic accuracy were calculated from measured values of various observations. Using these results, the χ2 test was used to compare analyze differences between the various conditions. As the gold standard, micro CT-revealed MBII (types II, III, or IV) in 52 of 86 teeth (60.5%) in all samples. Anatomical classification showed type I in 34 teeth (39.5%), type II in 13 teeth (15.1%), type III in 24 teeth (27.9%), and type IV in 15 teeth (17.5%) [Figure 3]. Dental CT showed 56.4% sensitivity, 76.4% specificity, 78.9% positive predictive value, 47.1% negative predictive value, and 64.2% diagnostic accuracy. These results closely resembled those for the gold standard. 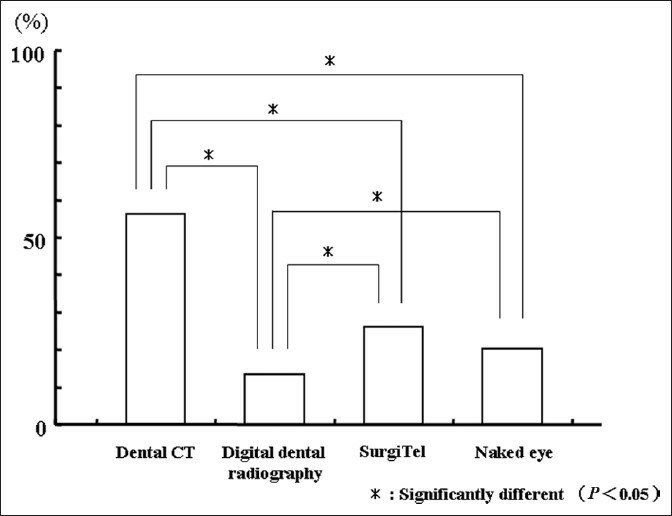 Digital dental radiography images showed 13.4% sensitivity, 84.6% specificity, 58.9% positive predictive value, 36.0% negative predictive value, and 40.3% diagnostic accuracy. Magnification telescope observation showed 26.1% sensitivity, 72.0% specificity, 59.3% positive predictive value, 38.5% negative predictive value, and 44.1% diagnostic accuracy. Naked eye observation showed 20.3% sensitivity, 76.0% specificity, 56.8% positive predictive value, 37.9% negative predictive value, and 42.0% diagnostic accuracy [Figure 4],[Figure 5],[Figure 6],[Figure 7] and [Figure 8]. Dental CT offered superior results compared with the other three methods for all inspection ratios, and significant differences were seen between the results of dental CT and the other three methods (P<0.01). 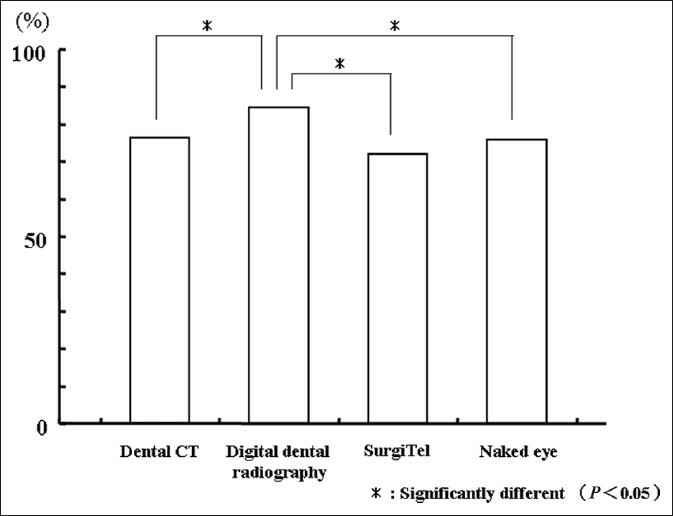 Digital dental radiography was significantly superior to the naked eye in terms of sensitivity, specificity, and positive predictive value, but the naked eye was superior for negative predictive value and diagnostic accuracy in detecting MBII (P<0.01). In this study, no significant differences in observation results were seen between researchers. Micro-CT as used for setting the gold standard was developed using industrial equipment for the purpose of nondestructive inspection of various materials. Very clear images can be obtained by irradiation with extremely small doses of radiation to the target. However, clinical application of micro-CT is impossible, as an extended period of radiation is required for imaging. Dental CT uses two kinds of imaging methods. One is the dental CT mode that revolves around the circumference of the subject and photographs the region at 42.7 mm height and 30 mm width. The other method is the panorama mode, in which the X-ray tube rotates five times in a spiral orbit. Furthermore, these images can be reconstructed to form multiplanar reconstructions and three-dimensional images. The radiation dose involved in dental CT investigation is basically comparable with conventional panoramic (mean effective does per once; 0.025 mSv.) radiological investigations. However, depending on the anatomical location and the setting of CT device, the radiation dose exposed to the patient could be kept to a minimum. The cone beam CT, which is a variant of conventional CT, is even more useful in dentistry as its radiation can be restricted only to the anatomical area being investigated. In addition, the radiation dose required by the cone beam CT is only one-fifth of the conventional CT and time needed is as short as 10-15 seconds. As for cone beam CT application, although there are many advantages than risks, it is important to have a clear objective for using this technique and then to define the anatomical area. Determining the anatomical condition of the mesio-buccal root of maxillary first molars before root canal treatment is difficult. Weine  and Kulilid et al. reported that the second mesio-buccal canal is located 1-3 mm toward the palatal canal from the larger mesio-buccal canal. However, discovery has been difficult in many cases with searches using thin reamers, since the root canal orifice of MBII is quite small and of variable position. 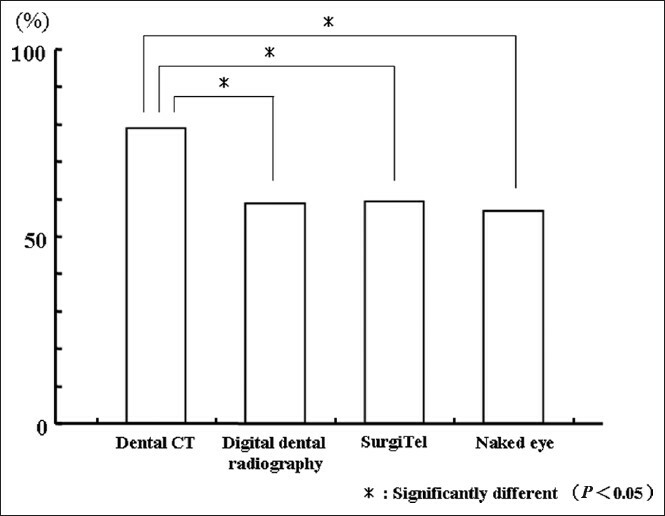 In terms of diagnostic accuracy and negative predictive value, naked eye observation was superior to digital dental radiography. In digital dental radiography, the two root canals of the mesio-buccal root cannot be distinguished in many cases, since these canals overlap with the direction of irradiation. In addition, MBII is a narrow root canal with a small orifice. The detection rate considerably decreased due to the interviewing of maxilla or periodontium in clinical situations. However, the detectability in vague observation is improved by adding an anatomical prediction. Good diagnostic accuracy was obtained under observation by SergiTel or the naked eye because the orifice of the root canal was searched for using reamers on the basis of anatomical knowledge. Hess et al. reported MBII in 54% of maxillary first molars, while Seidoberg et al. reported an MBII detection rate of 62% for extracted teeth and 33% in clinical situations. In this study, a detection rate of 60.9% was obtained using micro-CT. The detection rate by the naked eye was 51.4% of a result of micro-CT, which was 30% in all experimental teeth. Although direct comparisons cannot be made to the results of Seidoberg et al.,  our results were similar. Detection by magnification telescope or the naked eye is impossible for type IV. In other words the root canal treatment has often been finished without discovery of MBII, including types II and III. Even if MBII is detected, sufficient treatment is often difficult. However, success rate does seem to improve with detailed knowledge of the anatomical features. Radiographic and visual information generally cannot be directly compared, because type IV MBII cannot be absolutely detected by magnification telescope or the naked eye. The existence of type IV has a same adverse effect with MBII when its not discovered. 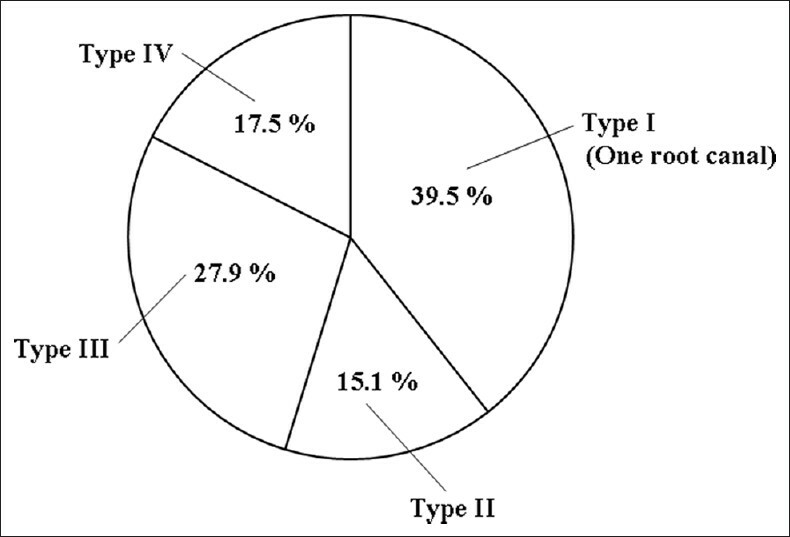 Type IV was thus included in the comparisons in this study. 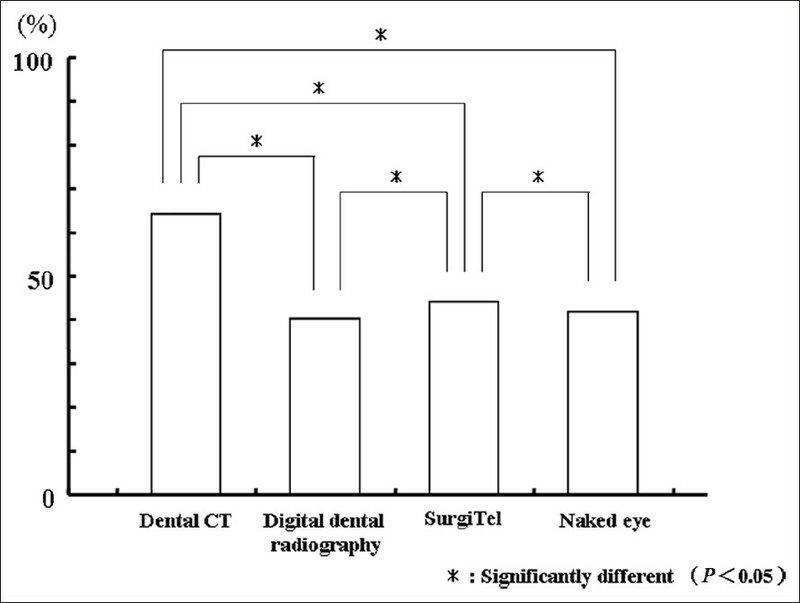 The present results clearly show that detection rate of MBII is higher for dental CT than for digital dental radiography. Dental CT is very useful for examination and diagnosis in root canal treatment. Few differences in the detection rate of MBII were seen between SurgiTel and the naked eye, although SergiTel was superior in terms of the time required and ease of detection. Detectability of MBII in the maxillary first molar was superior using dental-computed tomography compared to digital dental radiography, magnification telescope, and the naked eye. 1. Barbakow FH, Cleaton-Jones P, Friedman D. An evaluation of 566 cases of root canal therapy in general dental practice. 1. Diagnostic criteria and treatment details. J Endod 1980;6:456-60. 2. Barbakow FH, Cleaton-Jones P, Friedman D. An evaluation of 566 cases of root canal therapy in general dental practice. 2. Post-operative observations. J Endod 1980;6:485-9. 3. Morse DR, Esposito JV, Pike C, Furst ML. A radiographic evaluation of the periapical status of teeth treated by the gutta-percha-eucapercha endodontic method: A one-year follow-up study of 458 root canals. Part III. Oral Surg Oral Med Oral Pathol 1983;56:190-7. 4. Oliet S. Single-visit endodontics: A clinical study. J Endod 1983;9:147-52. 5. Pekruhn RB. The incidence of failure following single-visit endodontic therapy. J Endod 1986;12:68-72. 6. Stabholz A, Friedman S, Tamse A. Endodontic retreatment-case selection and technique. 3. Retreatment techniques. J Endod 1990;16:543-9. 7. Petersson K, Lewin B, Hakansson J, Olsson B, Wennberg A. Endodontic status and suggested treatment in a population requiring substantial dental care. Endod Dent Traumatol 1989;5:153-8. 8. Swartz DB, Skidmore AE, Griffin JA Jr. Twenty years of endodontic success and failure. J Endod 1983;9:198-202. 9. Odesjo B, Hellden L, Salonen L, Langeland K. Prevalence of previous endodontic treatment, technical standard and occurrence of periapical lesions in a randomly selected adult, general population. Endod Dent Traumatol 1990;6:265-72. 10. Yamaki K, Tomisawa S, Yoshida T, Sugawara T, Maita E, Shimauchi H. Clinical and radiographic evaluation of endodontically treated teeth. Jpn J Conserv Dent 2001;44:602-9. 11. Yamamoto A, Satoh S, Suzuki T, Kobayashi T, Iida I, Ueda H, et al. 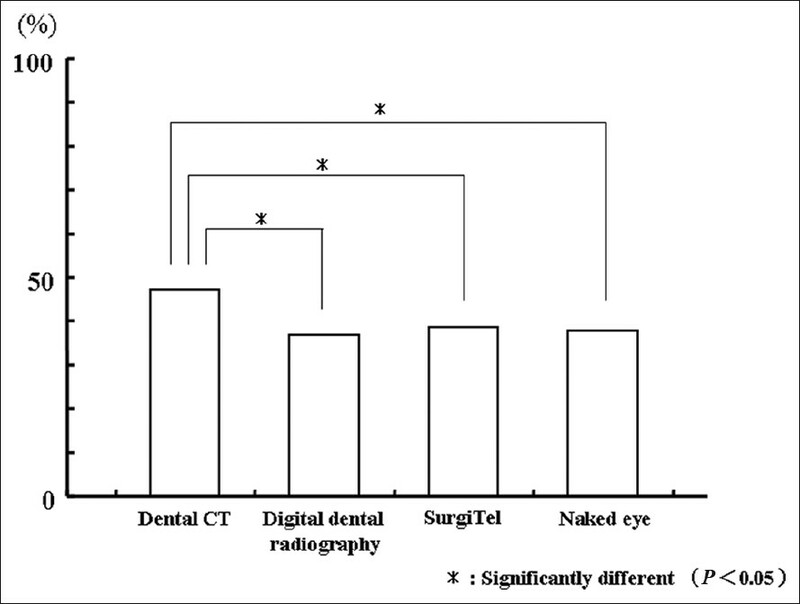 Clinical long-term observation on endodontically treated teeth-over ten years observation-. Jpn J Conserv Dent 2000;43:858-69. 12. Cunningham CJ, Senia ES. A three-dimensional study of canal curvatures in the mesial roots of mandibular molars. J Endod 1992;18:294-300. 13. Krithikadatta J, Kottoor J, Karumaran CS, Rajan G. Mandibular first molar having an unusual mesial root canal morphology with contradictory cone-beam computed tomography findings: A case report. J Endod 2010;36:1712-6. 14. Kottoor J, Velmurugan N, Sudha R, Hemamalathi S. Maxillary first molar with seven root canals diagnosed with cone-beam computed tomography scanning: A case report. J Endod 2010;36:915-21. 15. Ruddle CJ. Microendodontics: Identification and treatment of MBII system. Oral Health 1996;86:45-9. 16. Ruddle CJ. MBII root canal systems in maxillary first molars. J Endod 1995;21:38-42. 17. Ting PC, Nga L. Clinical detection of the minor mesiobuccal canal of maxillary first molars. Int Endod J 1992;25:304-6. 18. Weine FS, Healed HJ, Gerstein H, Evanson L. Canal configuration in the mesiobuccal root of the maxillary first molar and its endodontic significance. Oral Surg Oral Med Oral Pathol 1969;28:419-25. 19. Hartwell G, Bellizzi R. Clinical investigation of in vivo endodontically treated mandibular and maxillary molars. J Endod 1982;8:555-7. 20. Neaverth EJ, Kotler LM, Kaltenbach RF. Clinical investigation (in vivo) of endodontically treated maxillary first molars. J Endod 1987;13:506-12. 21. Fogel HM, Peikoff MD, Christie WH. Canal configuration in the mesiobuccal root of the maxillary first molar: A clinical study. J Endod 1994;20:135-7. 22. Weine FS. Endodontic therapy. 5 th ed. St. Louis: Mosby; 1995. p. 243. 23. Sempira HN, Hartwell GR. Frequency of second mesiobuccal canals in maxillary molars as determined by use of an operating microscope: A clinical study. J Endod 2000;26:673-4. 24. Buhrley LJ, Barrows MJ, Begole EA, Wenckus CS. Effect of magnification on locating the MB2 canal in maxillary molars. J Endod 2002;28:324-7. 25. Baldassari-Cruz LA, Lilly JP, Rivera EM. The influence of dental operating microscope in locating the mesiolingual canal orifice. Oral Surg Oral Med Oral Pathol 2002;93:190-4. 26. DE Carvalho MC, Zuolo ML. Orifice locating with a microscope. J Endod 2000;26:532-4. 27. Gorduysus MO, Gorduysus M, Friedman S. Operating microscope improves negotiation of second mesiobuccal canals in maxillary molars. J Endod 2001;27:683-6. 28. Arai Y, Tammisalo E, Iwai K, Hashimoto K, Shinoda K. Development of a compact computed tomographic apparatus for dental use. Dentomaxillofac Radiol 1999;28:245-8. 29. Tokuoka O. Making of panoramic CT (3D-high resolution CT machine based on the principles of panoramic radiography). 1 st ed. The proceedings of symposium of high technology center in Tsurumi University School of Dental Medicine; 2001. p. 103-4. 30. Mishima A, Kobayashi K, Yamamoto A, Kimura Y, Tanaka M. The calculation of patient radiation dose in the dental CT (PSR 9000). Tsurumi Univ Dent J 2003;29:7-12. 31. Robinson S, Czerny C, Gahleitner A, Bernhart T, Kainberger FM. Dental CT evaluation of mandibular first premolar root configurations and canal variations. Oral Surg Oral Med Oral Pathol 2002;93:328-32. 32. Linn JL, Goss AN. The role of spiral C.T. in endodontic diagnosis. Aust Endod J 2000;26:27-9. 33. Chang BJ. Ergonomic benefits of surgical telescope systems: Selection guidelines. J Calif Dent Assoc 2002;30:161-9. 34. Weine FS, Healey HJ, Gerstein H, Evanson L. Canal configuration in the mesiobuccal root of the maxillary first molar and its endodontic significance. Oral Surg Oral Med Oral Pathol 1969;28:419-25. 35. Kulild JC, Peters DD. Incidence and configuration of canal systems in the mesiobuccal root of maxillary first and second molars. J Endod 1990;16:311-7. 36. Hess W. The anatomy of the root canals of teeth of the permanent dentition. New York: John Bale Sons and Danielson; 1925. p. 3-35. 37. Seidoberg BH, Altman M, Guttuso J, Suson M. Frequency of two mesiobuccal root canals in maxillary permanent first molars. J Am Dent Assoc 1973;87:852-6. Betancourt, P. and Fuentes, R. and Aracena Rojas, S. and CantÃ­n, M. and Navarro CÃ¡ceres, P.